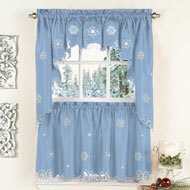 Elegant Patricia Valance & Curtain Set from Collections Etc. I bought these because everything came in one piece. Easy to install and very pretty in my living room. - Mary, Fla. I am VERY pleased with these curtains!! Nice inexpensive look for the bedroom! Beauty at a low price! Heaven. Beautiful,classy at an affordable price! Loved them, I have done my house with the things i order from this site. - Pam, Jesup,Ga. 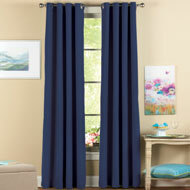 Second purchase of these drapes! Love these curtains. They look beautiful in my living room. Had to iron but that was easy. - Elizabeth, Long Beach, N.Y.
Made my dining room window pop! I love these curtains, very pretty. Very Nice Curtains and easy to hang up. Great Product - Can't beat the price!! what I was looking for. - Judy, Lamar,Ms. BEAUTIFUL!! JUST WHAT I WANTED! Love them. I have 4 pairs. The drapes are better than I expected. I like them because you can't see thru them.And I thought you could, so this is a plus. - Linda, Ft. White,Fl. Drapes are sheer , look good over window blinds and attached together for a couple of really long windows , saved me big money ! - Ibahunter, Lansing ,Mi. THESE DRAPES FIT NICELY,JUST WHAT I WANTED AND LIKE NICE BUY. - LENNY, CLEVELAND MS. 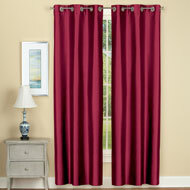 I got theses curtains for my mom to go in to her bed room she loves the curtains. - Sheila, Magnolia, Ky .
Great look for the money! Curtains were very easy to put up - none, Chalfont, Pa. Very happy with product and price! I really am pleased with the product just wish it was a couple of inches wider for the window. - calilbeans, Port orange, Fl. I like the product they are very nice looking up I just wish they came 63". - devilena, Gloversville, NY. 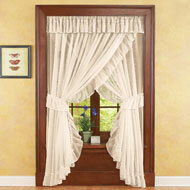 These curtains are a classy design with ease of hanging. One rod is all you need with the look of a two rod design, Very pretty and I've gotten many compliments on them. - Chris, Ilion, N.Y. Very expensive look at a cheap price!! I bought these curtains for my bedroom and they look like expensive curtains. They really look great. Very pretty. Love them!! - Country Girl, Montauk, Mo. Great Value for price point! the curtains i bought didn't look like the picture shows, I bought some wall decorations (Leaves) and they showed to be like a brass, and gold color, instead they were flimsy and more of a light brownish color. very DISAPPOINTED in them. MAYBE I WOULD RECOMMEND DEPENDING ON THE PRODUCT - ROSIE, PALMDALE CA. I would not buy these curtains again. Again, like the quilt very cheap looking. The main picture showing these curtains show colored curtains yet what was shipped was white curtains with colored valances and tiebacks, just opposite of what I wanted. - Ms Betty, ocala, fl. just glad i didn't pay a lot for these curtains....they would be o.k. if they were just a little wider..... - ac, valatie n.y.